For more than 30 years, this Indian uncle (K.Idrus) has been selling his brand of traditional Cendol with manually-shaved ice on Jalan Bunga Raya in Pasir Pinji in Ipoh …. I have a confession to make. I seldom go for roadside cendol in Ipoh due to several reasons. One being my ignorance as to which stall in Ipoh serves the BEST or most renowned Cendol, and secondly the compromised hygiene issue. Yup, as much as a Motormouth that I claim to be, sometimes the sight of blatant disregard to hygiene matters when a peddler is manning his stall is plain repulsive. We are not only talking about stained utensils, sloppily rinsed chopsticks, or greasy table tops here. But let’s not neglect the raging issue of personal hygiene (stained aprons, dandruff on shirts, long and grimy finger nails etc), and general up-keeping of one’s stall. Anyway, when I was Googling about for other blogposts on this particular stall; aptly named Cendol Pasir Pinji near to Padang Kilat on Jalan Bunga Raya in Ipoh, I found this post. Then only I realized that the nails embedded into the underside of the wooden block used to shave the blocks of ice might have been rusted after all! A bowl of refreshing Cendol with plentiful of red beans, and crunchy shaved ice chips. Oh well, after a lip-smacking noodle fest at Ang Ang Mee Hailam Parit in Pasir Puteh, we adjourned to this stall for a palate cleanser in the form of Cendol; a perennial favourite when it comes to desserts in Malaysia. The other obvious contender being Ais Kacang (ABC) of course, but seldom do we find roadside ABC here in Ipoh. He performed his magic, running his stall with much passion and gusto. 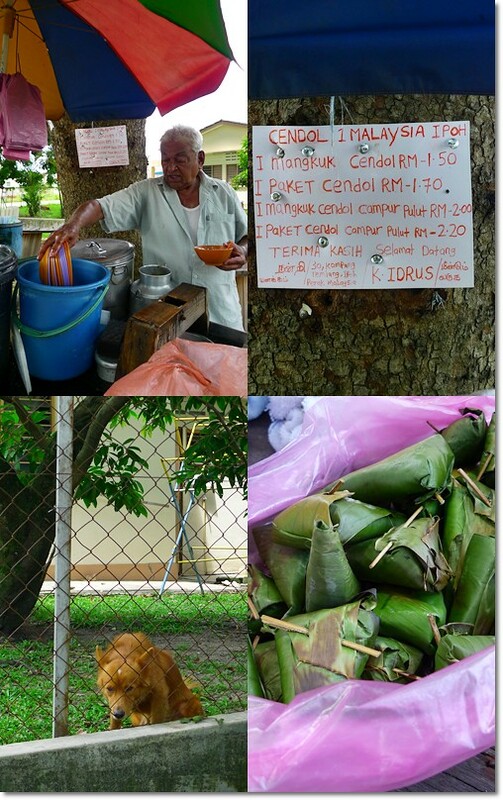 Everything served at his stall screamed homemade; from the wriggly worm-like strands made from rice/tapioca flour flavoured with ‘pandan’/screwpine leaves extract, the cloyingly sweet brown sugar syrup, and even the roasted pulut/glutinous rice wrapped in banana leaves. No matter how harsh the weather may be, sitting down under the shady trees and slurping on his creation never failed to satisfy. The cendol was short, stubby and of uneven shapes and sizes. Which was a plus, by the way; an indication that he did not source the faint green noodles from other suppliers. The kidney beans came in abundance, and the ice chips might not be as snowy fine like the ones produced from modern shavers, but lent a crunchy bite to every spoonful. For RM0.50/USD0.15 extra you can request for the addition of ‘pulut’ or roasted glutinous rice. As pathetic as this may sound, I never had Cendol Pulut in Ipoh before. There were occasions when we relished Cendol Pulut from Bismillah and Ansari in Taiping, and prior to that, even a random backlane stall in Tapah. But never Ipoh. Geez …. and I called myself Motormouth From IPOH. The Cendol from K.Idrus can be a little too sweet, so you can (or should) ask for him to hold back on the brown sugar syrup. Notice the uneven shapes of the cendol? All in all, aside from doubts about rusty nails, and the slightly tooth-numbing concoction, the Cendol was a pleasant change from its usually over-processed counterparts; especially those served in restaurants. By the way, this uncle named his stall “Cendol 1 Malaysia”, as cliched as that may sound. 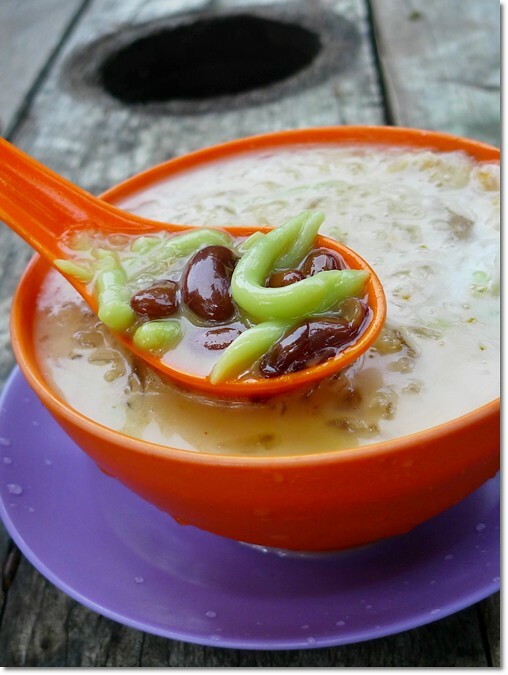 But everyone in Ipoh fondly calls this the Cendol Pasir Pinji, or Cendol Padang Kilat. So there …. let’s not get all worked up over names, shall we? Directions : Travelling on Jalan Bunga Raya from Jalan Pasir Pinji, you will see this stall on your LEFT before you reach Padang Kilat (a vast field) also on your LEFT. You will pass by Klinik Kesihatan Pasir Pinji (a government health clinic) on your LEFT before you see this cendol stall. Business hours : From about 12pm until his supply of the day runs out. Near to the Ais Sagu Pasir Pinji (Sek Lau Zhi) and the Pasir Pinji Yong Liew shop. Personally, I think for that effort he puts in on a daily basis, and the fact that he’s not stingy on ingredients, RM1.50 for a bowl is considered worthy. 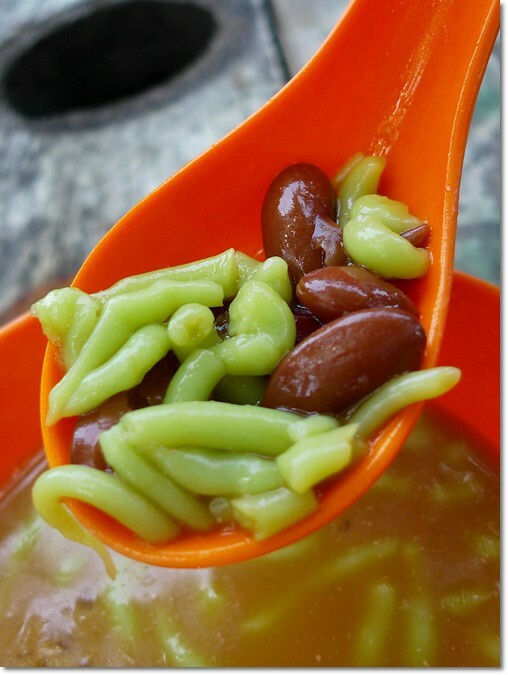 Lots of kidney beans, cendol, and generous drizzles of gula melaka syrup. 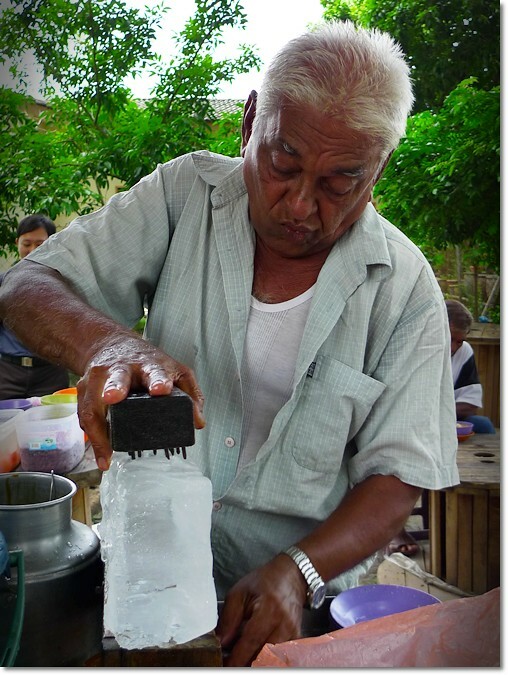 Plus a live show in seeing him using the most ancient apparatus to shave the ice block. He is my favourite and the best in Ipoh. Seek him out each time I go back for holidays in Malaysia. I always ask for extra gula and you can taste the beautiful rich caramel sugar with each spoonful of chendol….. yummm….He is there almost everyday in the afternoon. If you do not see his stall open for a few weeks, he is on holidays to India to see his folks. His son often comes out to help his dad with the stall. Thumbs up and you can hope over next door to drink the aromatic young coconut juice if you are still thirsty which I do as the heat in Malaysia knocks me out! The best in Ipoh. Got to try him and I always ask for extra gula as you can taste the rich caramel sugar with each spoonful of chendol as it slides down your throat. If you are still thirsty which I always do as the heat in Malaysia knocks me out, is the coconut man who sells aromatic young coconut by the van loads, chilled if you like or take away…He is next door to the chendol man. A must pit stop for overseas visitors. The chendol man is only there in the afternoon and he is not there 7days a week. I think he goes back to India on yearly basis for a few weeks. Hey….cheap things were yester years. Look at the soaring prices of all food commodities. poor chendol man got to make a living too….Try to buy a bowl of chendol in Melbourne. It costs AUD$4.50 and the chendol is made by the Vietnamese. A bowl of shave ice, with some chendol( oftenly they put the chendol in hot water to soften before serving), topped with canned coconut milk and scanty gula melaka. I still reckons the Indians in Malaysia still make good chendol. Very well said. Let’s hope his son carries on his legacy of a simple, traditional cendol stall. Indian style of cendol is very different from the Chinese version, and the Malay’s. I still have yet to find a cendol that knocks me out here in Ipoh, this Padang Kilat one came close but a nagging fear of hygiene matters compromised the ratings. Penang Road’s Teochew cendol still tops for me, though definitely pricier and smaller in portion. Malacca’s version with the tremendously thick gula melaka is good, but somehow I have yet to find the best there. Taiping’s Ansari fared well enough, certainly better than Bismillah’s, in my opinion. Street, never tasted such fragrant thick tasty gula melaka which Malacca is famous for. I have yet to taste their famous durian cendol. There is a nice one in Kl near Sri Petaling. 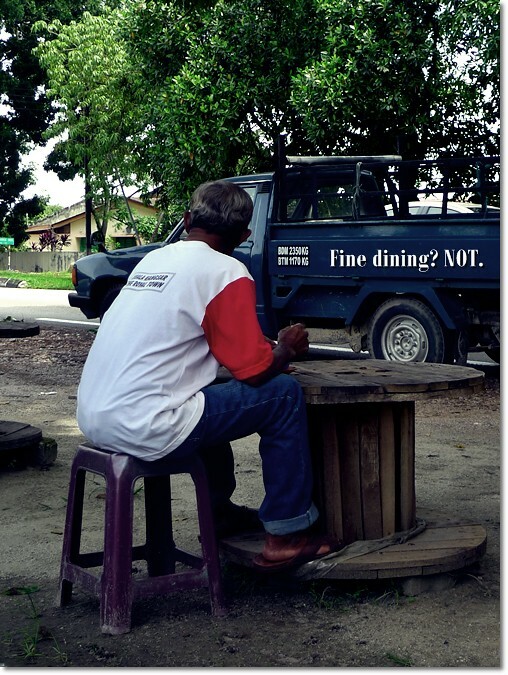 He parks his van near the roadside and he sells Indian Rojak too. His one is nice but I still aces the special gula melaka in Malacca. For nice cendol really comes to the soft cendol and the most important ingredient is the palm sugar. My sons are dying to go back to Malaysia for holidays and have cendol everyday!!!! I can’t deny that. Malacca’s cendol is in a class of its own. The amazingly thick and luscious gula melaka is the definite wow factor here. The cendol and beans coming a close second. But Jonker 88’s version got from bad to worse. Thankfully, during the last visit, the one at Donald & Lilly’s managed to impress. Nothing beats a bowl of cendol on a hot day! Somehow the mobile/roadside cendols always taste better.. Very nice n cool friend..Something special for u.. Don’t Miss it! Haha, have a refreshing dessert and supplement your daily iron intake at the same time, courtesy of the rusty nails! Someone should sponsor him some quality stainless steel nails (not those from China) lah! Or even better, get some medical supply company to sponsor him some surgical steel nails! Like that sure pass DBI health inspectors! Daily iron intake?!! Hahahaha …. that’s a good one. I hope he was using stainless steel nails that time when we went. But I did not bother to check, seriously. I used to have at least 1 each week when I was small!!! Uncle, I miss u! He always give me extra cendol, kurang manis! hehez… Wish to have a bowl now! He is still there. And this stall I am sure, will bring back much memories to most staying around Pasir Puteh-Pasir Pinji area. Found the cendol stall today Nov 2016. Same place. K.Idrus. His son helping out. Everything described in the article is still true. Very good, brown sugar is a bit much.